We've all seen it: an old dilapidated guitar collecting dust in the corner of a thrift store. Or maybe it's lurking in some deep, dark corner of the internet listed behind a single dimly lit image. Not very appealing is it? It's simple: a well-maintained and well-presented guitar or bass is much more likely to complete a quick sale at maximum value than a neglected one. Here are some steps you can take ensure your gear is as attractive as possible when selling on Reverb. Sounds obvious, but even big-name music stores neglect this simple step leaving their showroom full of dusty, grimy instruments. Take the time (about 5 -10 minutes on average) to give at least a basic cleaning. This leaves an important impression: if it’s clean, it must be well-maintained. Most guitar stores sell cleaning kits with recommended materials to clean your instrument. But even a simple once over with a lightly dampened cloth can make a huge difference. Be advised, many household cleaning products are not suitable for cleaning guitars. Also avoid using a scratchy paper towel; a sock or old t-shirt works much better. A guitar tech mid setup. 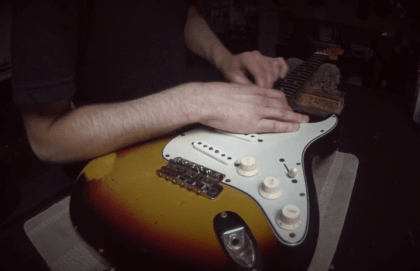 A setup is a process in which a guitar tech inspects, adjusts, and resets different parts of an instrument to get it into peak playing condition. Like changing the oil on your car, guitars and basses should be setup regularly. Setup steps include checking the straightness of the neck and levelness of the frets, and adjusting the truss rod and bridge in order to optimize the intonation and action of the instrument. Many guitar techs will also inspect the electronics to make sure all the pots and connections are working as they should. When it comes time to sell a guitar, a good setup can easily move the instrument up a notch in the condition category, making it much more attractive to buyers. Think of it as investment. If you’re selling a $100 Harmony, maybe the $50 setup doesn’t make sense. There are still plenty of players looking for these sorts of instruments as fixer-uppers or project guitars. If, however, you’re hoping to get $1500 for an old Strat, investing the $50 definitely improves your chances of getting your asking price. 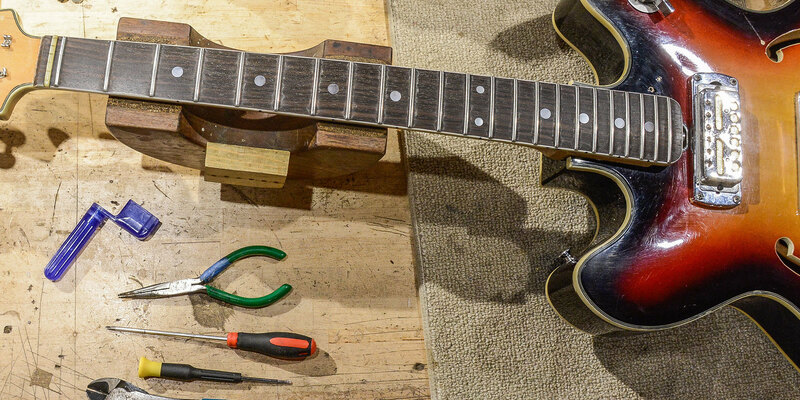 Now that you're guitar or bass is looking its best, it's time to list it on reverb. You want to make sure you have an accurate description, and a number of clear, well-lit photos. For tips on how to make a great product listing, be sure to check out this entry on the Reverb blog. Happy selling!